Just because it’s usually the smallest room in the house doesn’t mean the humble laundry should be overlooked. Given that the room usually performs multiple functions, if you have a tight work space careful planning will help you make the most of the available space. To fit in everyday laundry essentials like ironing surfaces, racks for drying delicates and hanging garments, you need some clever design ideas. 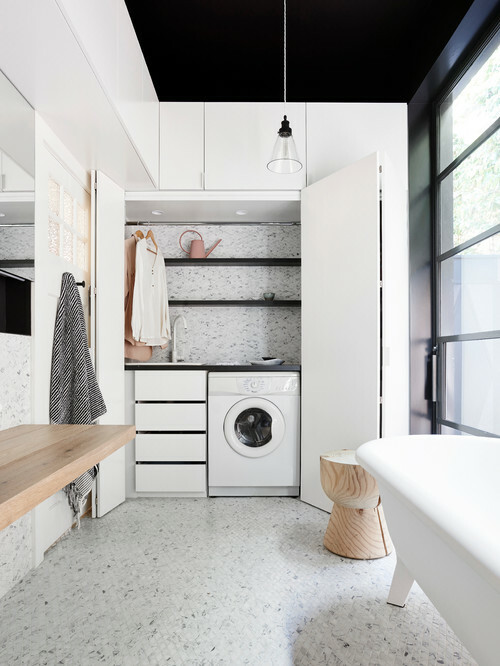 Here we will unpack five brilliant ideas Nu-Look uses to create small laundries that are stylish, practical and optimise all the available space. Smart storage is the key to making a small laundry work. If your cupboards are full to the brim, it might be time to consider installing a new storage system, so you can better organise everything from detergents, clothes and electrical goods. You’ll want a storage set-up that helps prevent clutter from building up and allows you to find essentials with ease. Think vertically for a narrow laundry and use the height you have - shelves or cabinets that go up to the ceiling are all good options. You can use the very high sections for items that you don’t regularly use, but still need to be stashed away for when they are necessary. 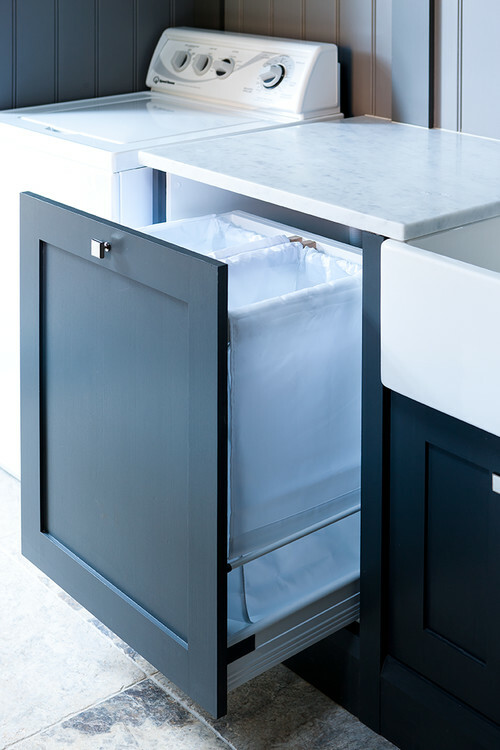 Cabinets that have fully adjustable shelving so that you have the flexibility to add and delete shelves within a cabinet to separate things like linen and towels means the space is versatile and can change with your needs. Single wall laundry rooms can work exceptionally well when space is tight, starting with benches that occupy the full length of the wall. If you decide to go down this track, utilising multi-purpose appliances not only saves you room, but allows for extra shelving and additional storage. 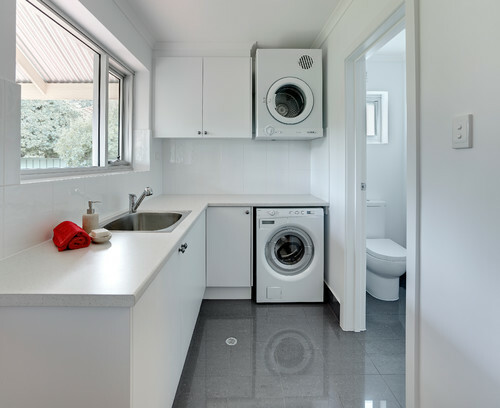 A popular option among home renovators is to mount a benchtop above a front loader dryer and washer, giving you extra bench space to fold clothes, as the appliance conveniently sits underneath. When you make the most of your walls and nooks, it’s possible to find space where you didn’t even know you had it, using a combination of rails, shelves and baskets on your walls. There’s been an explosion in products improving storage capabilities and many of them are creative in reducing visual clutter and helping store those bulky products when not in use. A handy idea is stowing an iron board that can be pulled down but also stored out of the way against the wall - a perfect option for a really confined space. Likewise pull out laundry hampers are ideal for keeping your dirty laundry out of sight but still in reach and organised. You can avoid the laundry squeeze if you arrange your spaces and appliances in a flow. 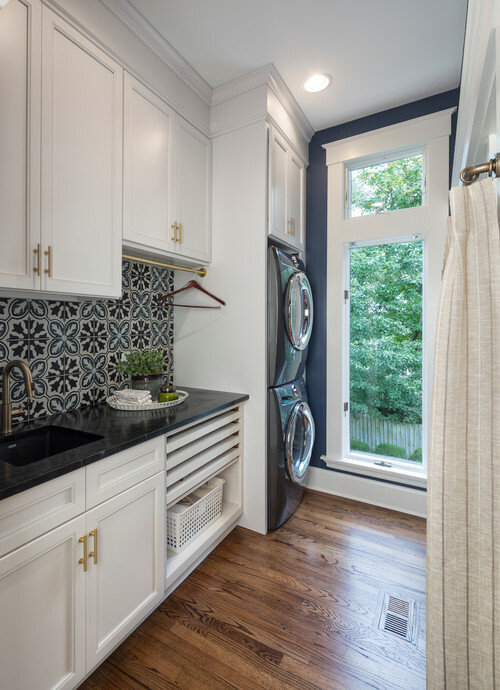 There are plenty of systems of cabinetry and hanging racks to ensure a smooth process for doing your laundry, saving you time and mental space. Whether its multiple built-in laundry hampers used for sorting dirty laundry or a fold down clothesline that sits neatly against the wall when not in use, you’re spoilt for choice when it comes to creating a space that makes doing the laundry more convenient for busy households. If you have enough room between the overhead and bench for clearance, you can install a hanging rack over the dryer to hang shirts to dry and even get a steam iron when the dryer is on. Light is a big advantage in small spaces, helping to brighten dark corners and make tight rooms feel bigger. Once you have decided on all the basic elements of your laundry, then you can get to work deciding on the best type of lighting. One very practical, modern looking option is to run LED strips above benchtops to spotlight work areas in addition to putting quality ambient lights in the ceiling fixture. If you don’t have the advantage of a window to create natural lighting, consider installing a skylight for illumination and save money down the track on electricity costs. To control the lighting and ensure a private setting, consider installing a laundry door with an integrated blind system which can work perfectly for your compact laundry area. At Nu-Look Renovations we realise that each family needs and requirements for a laundry are different. 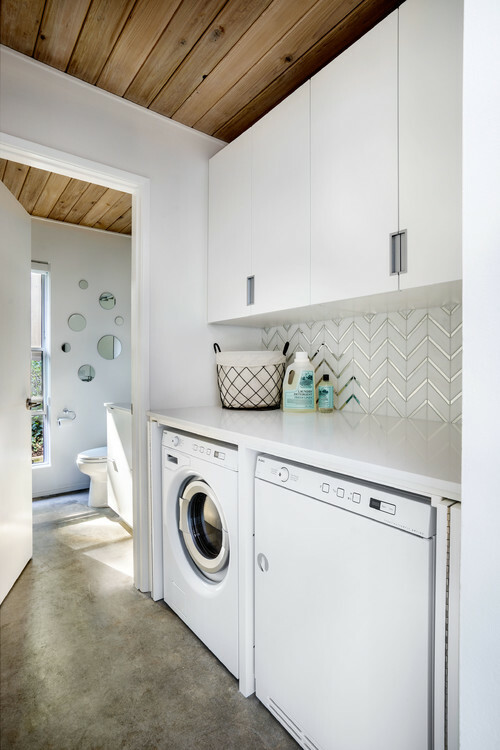 We would love to catch up and workshop how to best utilise the small space you have to renovate a laundry that doesn’t just work hard but looks good too!